Have you ever wondered what all that lava and geologic turmoil under our feet sounds and feels like? Me too! 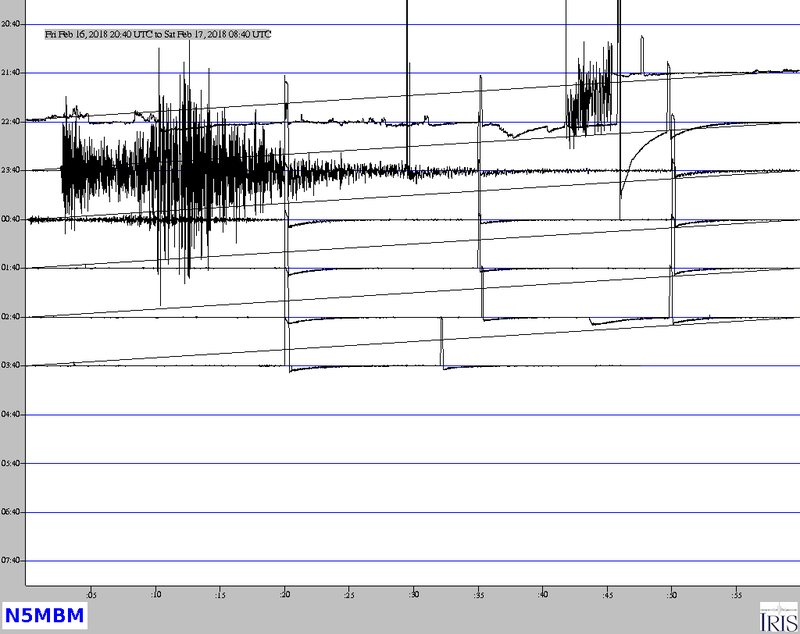 For many years I had wanted to setup my own seismometer, just to tinker with it and see if I could capture events like many other volunteers across the web. Even before the web, fellow Amateur Radio operators like John Cole and Frank Cooper inspired me to set one up. They have been tinkering with these since the '90's. I believe John and Frank are both gone now, thier web prescence is either gone or hasn't been updated since 2016. I thank them very much for the inspiration they gave me over the years with scientific projects, astronomy and Ham radio. They will be missed. Now, a couple of years later, I have installed it out in the barn. It's a much better place for it as it is rather quiet over there, on that big slab of concrete. I have had it up for several years now and I am impressed with how sensitive this instrument really is, how easy it is to filter noise with the software and how it just simply "works"! 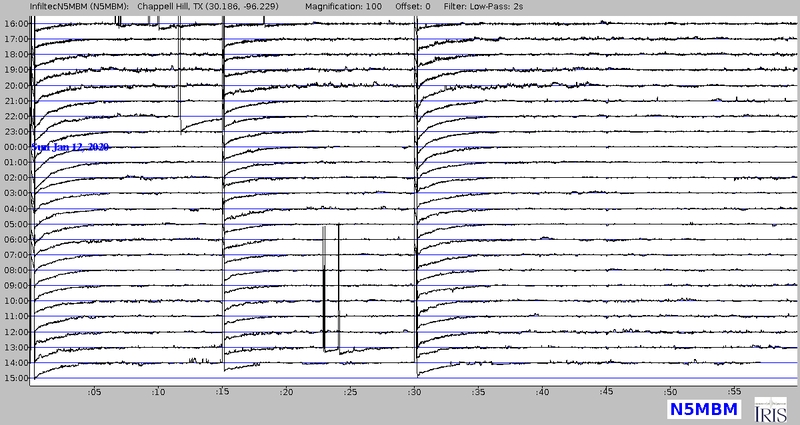 I even have it uploading a screen shot of my seismometer software (jAmaseis) to my website every few minutes! One other thing I REALLY LIKE about it, it is extremely PORTABLE! With the bubble level on top, it's rugged design and the "no calibration" capability it is perfect for taking out in the field and using it for temporary and portable installations! The AS-1/AQ-1 fulcrum design can't compete in this arena! I would highly recommend this unit for those of us who want something that just simply "works" and can be easily used to verify the performance of other "home-brew" designs. I am pretty impressed, after a couple of years of constant use! 1) It is NOT weather-proof! But it is pretty easy to put it inside something that is! Mine is wrapped in thin plastic and sits on bricks inside the barn where it is safe, dry and in a quiet environment. 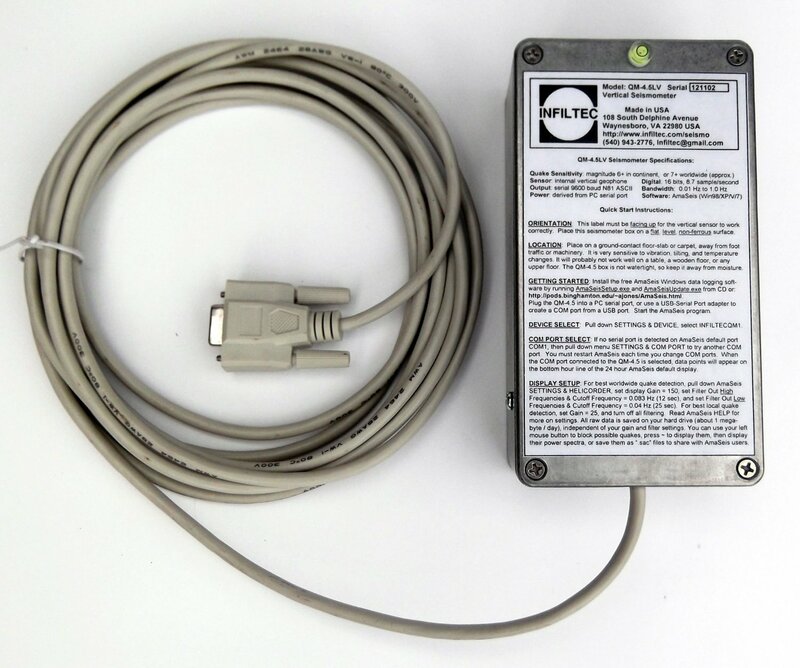 2) It has a big 9 pin serial connector - good luck stuffing it through a small hole in the wall or floor. I am using 9 pin to USB adapter with a long USB cable. It's easier to poke those through holes in the wall. 3) The Amaseis software is great, but it barfs on Windows 7 once in a while, making you have to re-start the PC it is connected to - once in a while. Which is a pain in the neck if you run it on a machine that does web duties and is online 24/7/365 in a RACK full of servers like I do... You just have to keep an eye on it! Note: It hasn't locked up in quite a while on the Raspberry Pi running Linux! If I had to do it again - I would buy this unit again in a heartbeat! It arrived within a couple of weeks, unpacked and installed in minutes and has been a very sensitive and reliable instrument - the software not withstanding... It is rugged, portable and affordable for an instrument of its quality. If you are thinking of owning one - GO FOR IT! Expect it to take about a week to ship to your door. Setup will take less than a half hour! If you refresh this page - you will see updated info. If you click on the images and refresh the page, you will see updated info.